Ah, those objects of every day, those inanimate friends—or are they slaves?—that serve us thanklessly before the sun has even brightened the horizon. What can possibly give more comfort than a favorite coffee cup? And a favorite coffee maker to fill it? Usually these objects tell tales and fill in autobiographical gaps, reminding us of who we are, how we came to posses them, and how together we and they ended up “here”— wherever here happens to be. Perhaps that’s why we like so much to hold them in our hands before we’ve even encountered ourselves in the morning mirror. They know us but don’t judge us. We know them and love them. Where would we be without their humble presence? In this house, the things in question are two Alessi caffettiere (coffee makers) and two French pottery mugs. 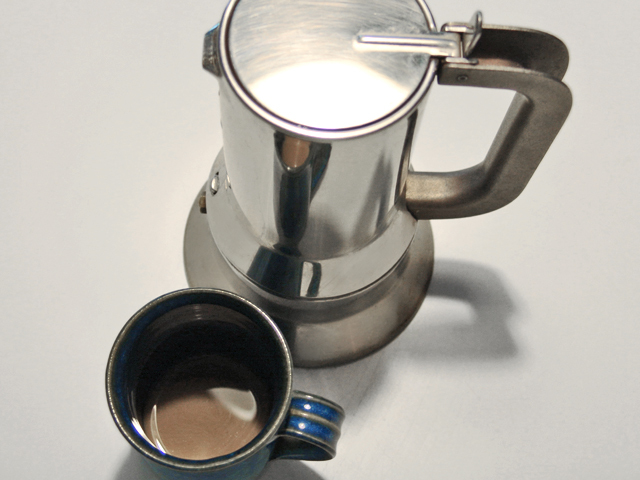 The large Alessi makes two good-sized espressi or one very abundant caffè lungo. The small one makes a single serving. They are designed identically—their tops separating from and re-attaching to their bottoms with a satisfying, well-engineered click of the handle. 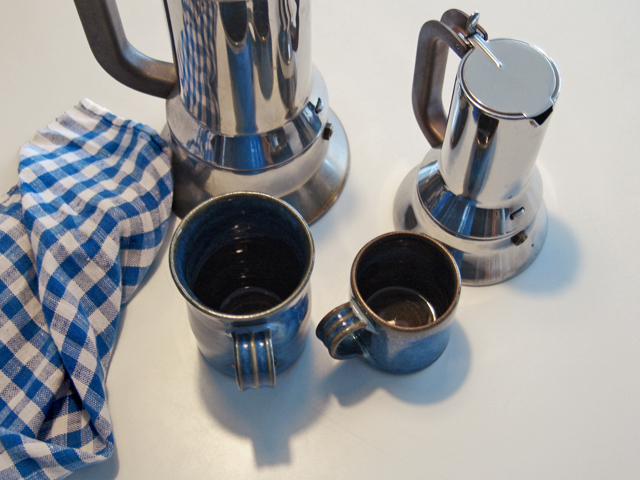 Their Milanese sleekness is perfectly balanced by the rusticity of the blue French mugs. City meets country. Italy meets France. Stainless steel meets clay. Coffee meets coffee cup. And thus, the long shadow of sleep meets the light of a new day. This entry was posted in IN THE HOUSE, ITALY and tagged Alessi, caffettiere, coffee, coffee maker, France, Italy, Milan, moka, moke, mug, pottery. Bookmark the permalink.